The burgeoning trend for artistes to release their own material rather than rely on a record company to issue, market and promote their wares is certainly growing in the UK. How you make yourself stand out from the crowd in such a competitive market is one of the biggest challenges but Jack Arthurs got his break when the influential “Prog” magazine used a track from Only Dreams Comes True on one of the sampler CDs that accompanies every issue. The chosen song certainly stood out from the rest being yet another example of how British singer/songwriter/acoustic guitarists dominate the UK musical landscape and Jack Arthurs could well be one of the latest torchbearers of the genre. Arthurs is based in the north east English city of Newcastle, famous for being the hometown of that great folk rock band Lindisfarne and also Sting. Originally, Arthurs came to the north east 23 years ago to attend the city’s university where he met a fellow musician with whom he played in pubs and the students’ union but they went their separate ways . After a spell working in the Lake District and London, Arthurs returned to the north east where he and his friend reunited and put together their own band Greyhound in 2009 who, local sources say, sound like the Police and Rush with shades of U2 - an interesting combination for sure! But drawing on literary influences and personal life experiences, Only Dreams Are True reveals a very contemplative and sensitive side to Arthurs with just his clear, melodic voice and his trusty acoustic guitar the only sounds audible throughout - and all produced and engineered by Sean Taylor. 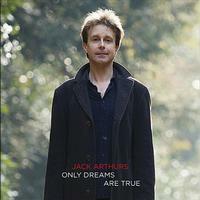 Only Dreams Are True is a wonderfully sweet and tender collection of songs by a talented and insightful artist. Some may find it a little samey as it never really steps up a gear, but there is much to enjoy and admire in Arthurs’ delivery and the sentiments of the songs. All self-written by Arthurs, the songs sit together very comfortably and naturally, starting with the title track with almost a Joni Mitchell style of acoustic strumming. That sound continues with “Wonder” where his voice hints at the late Clifford T Ward, one of the great British singer-songwriters. This piece, the track used on the “Prog” sampler, is probably the strongest track lyrically as well as being a hauntingly beautiful song which hints at Nick Drake with its aching sensitivity. The melody of “Missing” is very reminiscent of Clifford T Ward’s classic Gaye as is Arthurs’s singing. This is a far more attacking composition though the repetitive chorus hook probably could have done with a little bit of editing. This returns to sensitive Arthurs with some delicate guitar work and a plaintive vocal. “Nightwalk” is the only instrumental on the album but probably one of the stand-out tracks with its infectious rhythm and Arthurs’ multi-tracked voice enhancing the melody adding another silky layer to the soundscape. The album rounds off with “Autumn,” a wistfully reflective song which ebbs and flows with guitar work that nuances James Taylor. This carries on the theme of personal growth in life and in love.